While yesterday we gushed tirelessly over the HP 15-ay013nr, an affordable laptop that comes packed with a Full HD screen, 128 GB of SSD storage, Core i5 CPU and 8 GB of RAM. Today we're going to take a moment and review it's "brother"; the (also very affordable) HP 15-ay011nr. 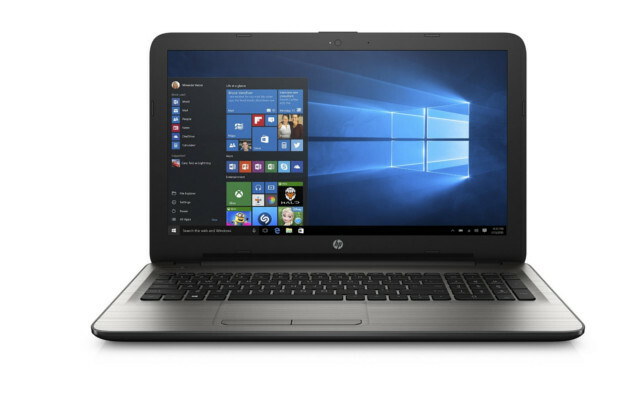 This new HP model takes on most of the specs of the ay013nr. However, it swaps the SSD storage, one of our favourite features, and goes down the more "conventional route" with a 1TB hard drive. For those who value storage capacity over storage speed this would be a better fit since it's still a spectacular laptop with either storage format. Now, without further ado, let's get on with our review of the HP 15-ay011nr. As we stated in our previous review, we simply love the design that HP has taken on for its new line of mid range laptops. With an aluminium finish and a polished metal design, the HP 15-ay011nr is designed not only to look slick and modern but also to keep itself cool when we become very demanding with the processor. The screen, one of its standout features, is a 15.6 inch WLED-Backlit display with a Full HD resolution and anti-glare technology. It used to be that we would only find this type of panel when we payed quite a bit more but lately it's becoming the standard to which many mid range laptops are clinging on to. Despite swapping the hard drive for an SSD, the HP 15-ay011nr has managed to maintain a very comfortable weight of just 4.73 pounds and it's thickness hasn't varied either with 0.95 inches under its belt. The only con, if you can even consider this to be an actual con is that, while sporting a fully fledged keyboard, this notebook does not have backlighting, a feature that we're more than willing to look aside when we take into account the rest of the specs. As we dive deep into our HP 15-ay011nr review, we find that under the hood this laptop features an Intel core i5-6200U dual-core processor. This is an excellent CPU and the very last i5 launched to the market at the date of this publishing. It's base frequency speed is 2.3 GHz but it can go up to 2.8 GHz thanks to the turbo boost feature. If you want more numbers we'll also tell you it's built on 14nm technology, boosts a 64 bit architecture, four threads and 3MB of Intel's Smart cache (now that's a mouthful). This is the best processor you can hope for in a mid range laptop. It's great for a wide assortment of tasks that go from basic computing to downright demanding stuff like editing high definition videos, creating infographics, running one or more virtual machines as well as coding and compiling. All in all, it's your jack of all trades in the laptop CPU world therefore it's very rare for anyone to not be pleased with its overall performance. However, performance can't be measured solely by the CPU implanted, RAM will also play a crucial role in how your laptop deals with multitasking and that's where the 8 GB DDR3L SDRAM module comes into play. 4GB is the default standard for most laptops and it works well for basic multitasking but if you're in need of a laptop that can handle extensive multitasking then you're going to need to go down the 8GB path. Also, even if you're not what one would call a power user, 8GB would also ensure you that your laptop remains useful for many years since we all know that as time passes software becomes more a more resource-hungry so having an extra few GB of RAM to spare is never a bad thing. Storage, while not of the SSD variety like the HP 15-ay013nr (check availability), is composed of a 1TB hard drive that works at a speed of 5400 rpm. We're gonna level with you, having an SSD over an HDD does make a big difference on storage speed. That said, if you value capacity over velocity and you don't mind waiting a few more seconds for everything from powering up to powering down your laptop and accessing files then the hard drive in place shouldn't present much of an issue. HP has made it clear with this laptop that they're in it for the win, from start to finish. With that in mind, the company has designed the 15-ay011nr's battery life to last over 7 hours unplugged. We are all pretty skeptic about how this would translate into real-life usage but even if we downgrade that to 6 hours of actual usage, it's still on the upper end of the spectrum for a laptop with these specs at this price. Another feature that we're most pleased with and it's a feature that most manufacturers keep ignoring is the WiFi antenna. Specifically, this laptop comes with WiFi a/b/g/n/ac support which, through a compatible router, is able to deliver a much faster internet connection than your standard b/g/n antennas. Many people don't know this but for me it's an essential feature to look for. As you might've already suspected, this laptop is not intended for gaming. This is clear when you take a look at it's graphics chip; an integrated Intel HD 520 graphics card. Sure, some light gaming might go under the radar but the moment you wanna play graphically demanding games you'll quickly come to realize that the HP 15-ay011nr is not designed for gaming in any "real sense". Surprisingly HP decided it wouldn't ditch the DVD reader on this model and while there are three USB ports, only one of them is USB 3.0. Otherwise, we've got your typical HDMI, ethernet ports as well as an SD card reader and audio jack. The lack of more USB 3.0 ports is certainly odd but we believe we can let that one slide along with the lack of a backlit keyboard since these are truly minor details in the grand scheme of features. We came into this review of the HP 15-ay011nr already having fallen in love with its sibling. In our professional opinion, the HP 15-ay013nr is better because of the inclusion of an SSD drive. Once that's out of the way, if you care more about capacity than speed then this laptop is an excellent choice. The CPU is top notch, RAM is great for intensive multitaskers, battery life goes above and beyond average and the WiFi ac connectivity is a nice touch that will improve velocity for many users. No, this is not a gaming laptop but we never claimed it was. As a general purpose laptop either for heavy users or light users who don't wanna worry about performance issues down the line this is an offer that's hard to resist. You can look up pricing and availability here. Hi,I am confuse about this laptop and Dell Inspiron 15 i5559-4682SLV Signature Edition, which should I buy. Could please help me. Both have similar functionality except touch screen and backlit keyboard. I believe they're both great options. Personally I would opt for the HP model because I'm not that into touchscreens and though the backlit keyboard is definitely a plus it's hardly one that would justify the existing price gap in my opinion. The ethernet is only 10/100, not a gigabit port. That is a bummer for 2016. Hi i took this laptop HP 15-ay011nr last week. am getting a thin line running from left side of the screen to right side. please let me know is it any fault of the laptop. i wanted to return the laptop. please suggest. I have tried to change the screen saver and change the settings. still the same thin blue color line is seen on the screen when switched on the laptop. Hi, as far as I know what you're experiencing is an isolated incident. That said, if it's got one year of international warranty then I would reach out to HP's headquarters in India and see what they have to say about it. Have you tried to reach Indian team about this issue. please update as I am my uncle is going to buy from US to India for me.. does it have international warranty? Hey. Im an incoming freshman, and will be majoring in computer science. Will this be a good laptop for me, or what would you recommend me? I'm studying computer science and information technology, is this computer suitable for me? Thanks for providing the Hp laptop review. If you find any problem in your laptop then HP Support Center is there to help you out and solve all the problem.